If you are interested in Poker Books and Gambling Magazines, you've come to the right page. The Pokerfather has listed the Top 8 must have Poker Books. These books should not only help improve your poker skills but also improve your win/loss percentages. Of all of the books I've read on Hold'em, this one covers the broadest range of games. While other books tend to narrow their focus down to a particular type of opponents, Mr. Carson emphasizes changing your play to fit the game. There's actually a situation for which he recommends a pre-flop raise with Qxs, which I found quite revealing.. 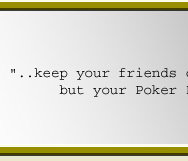 I have been playing NL poker online and limit poker in casinos for about two years. My preferred game is single table tournaments and after a year of success online I decided to put my skills to the test. This book really breaks down the art of poker (that is, the ability to read people)into simple categories of tells understandable and recognizable by anybody. Armed with my technically sound online skills and my newfound ability to understand the motives and intentions of other live players, I journeyed to Atlantic City to try my first ever live tournament..
Matthew Hilger thoroughly and completely explains in this book, you can really up your per-hour win rate by playing online. He takes the worry out of playing online, gives you a group of safe online poker rooms to visit, and he gives you the winning strategy you need to make money online (his basic strategy also works for land-based games). Matthew uses his personal experience to guide you through the learning process. There are individual chapters on strategy for the most popular casino games (Texas Hold 'Em, Seven Stud, Seven Stud/8, Omaha/8), all of which were very clear and helpful. However, unlike any title I've seen before, this book is a COMPLETE reference, including chapters on poker tournaments, becoming a pro, Internet poker, and even video poker (which my mother found excessively useful). Like all "Dummies" books, there are entertaining sidebars about great games, poker legends, etc. All in all, this is an entertaining book filled with invaluable information for all levels of play. Highly recommended! 52 TIPS FOR TEXAS HOLD'EM is simple and concise. It provides someone who has played little or no Hold'em with a sound basic strategy that will add to both his enjoyment of the game and his bottom line. Best of all, it presents a strategy that helps you steer clear of many of the common pitfalls in Hold'em, pitfalls that can quickly erode your cash. Staying out of potentially dangerous situations is very important to a new player like me. I purchased this book because I saw a TV show that said "Video poker can be beat". I found this hard to believe but it is apparently true on some machines with perfect play. Ah, there is the rub. Along with the book I bought a computer program that teaches you how to play and shows you each error you make. It isn't real hard to learn how to play perfectly but requires a person that can really keep focused for hours on end. Most folks with the intellect to learn this could make much more money doing something (anything ?) else but if you have to gamble this is your best shot. This book with Frugal Gambler and some real effort will make your Vegas trips more fun. I don't think Vegas casinos enjoy losing so I wonder how long this will last? The best advice in the book has to do with the psychology of online poker relative to table games. Understanding this is critical for people like me who migrated from neighborhood games to online, because I was totally baffled by the style of play, and its a huge mistake to assume that what one is seeing has to do with an increase in players' skill. This alone can shred quite a few hard-earned bills. On top of that, there are some "gotchas" in the mechanics of internet game play that the book explains (like thinking you're calling $1 when in reality its $100, or playing like a video-game zombie). Buy this book BEFORE you waste your bucks. 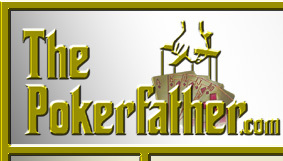 ThePokerFather.com is an independent online poker information website not affiliated with any poker room. 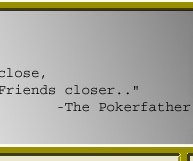 Copyright © 2005-2011 The Poker Father Online Poker Site - All Rights Reserved.